FEATURE — Have you heard of the Blue Zones? About 12 years ago, best-selling author Dan Buettner teamed up with National Geographic and the world’s best longevity researchers to identify pockets around the world where people lived measurably longer. In these areas they termed “Blue Zones,” they found that people reach 100 years at rates 10 times greater than in the U.S. The five main groups who meet the criteria are located in: Loma Linda, California; Sardinia, Italy; Okinawa, Japan; Nicola Peninsula, Costa Rica; and Icaria, Greece. 1. Move naturally: Movement is a natural part of their day. Their lifestyle encompasses continual physical activity throughout the day, instead of having a set time to go to a gym. Those who work at a desk for most of the day can participate in something I call “exercise snacks.” Set a timer to go off each hour, at which time you take five minutes to walk and stretch before heading back to your desk. 2. Purpose: A sense of purpose is worth up to an extra seven years in life expectancy. Why do you wake up in the morning? Do you engage in meaningful work and find purpose in what you spend your time doing? 3. Downshift: Most Americans have it all wrong – more is not necessarily better. Don’t we all seem to be striving for bigger and better by doing MORE? Downshifting, or finding ways to rest, relax and rejuvenate actually increases productivity. Stress leads to chronic inflammation and is linked to many diseases. Find a routine to shed stress and set aside time each day or each week to do something that helps you reconnect with yourself. 4. The 80 percent rule: This means stop eating when your stomach is 80 percent full. In addition, these groups eat their largest meal midday and their smallest meal in the late afternoon or early evening. Also, they don’t eat after their evening meal. You may not need to follow this exact pattern, but I believe it speaks to the importance of fueling yourself well during the day. Avoid skipping meals, which can lead to extreme hunger and overeating. 5. Plant slant: These groups have at least 75 percent of their plate coming from the ground. They eat high fiber meals that are rich in antioxidants, phytochemicals, vitamins and minerals. Meat is eaten on average only five times per month, and servings are about 3-4 ounces cooked (the size of your palm). Beans are the cornerstone of the centurion diet; I encourage you to use them as your protein source at least once a day. 6. Wine at 5: People in some of these Blue Zones drink alcohol moderately and regularly. They drink 1-2 glasses per day, with friends and/or with food. 7. Belong: All but 5 of 263 centenarians interviewed belonged to a faith-based community. Research shows attending faith-based services four times per month will add 4-14 years of life expectancy. Ultimately, feeling a part of something bigger than yourself can increase quality and length of years. 8. Loved ones first: Blue Zones are known for their deep appreciation for family. They keep aging parents and grandparents nearby or in the home (lowers disease and mortality rates of children in the home too), they commit to a life partner (which can add up to 3 years of life expectancy) and they invest in their children with time and love. Enough said. 9. Right tribe: You know that quote that says, “You are the average of the 5 people you associate with most?” These Blue Zones take that to heart. They choose – or are born into – social circles that support healthy behaviors. I appreciate the data from the Blue Zones. It shows us that we can create our own blue zone, that health and wellness is multifactorial, and it encourages a holistic approach to life. It has very little to do with fixating on numbers, killing yourself at the gym or giving up carbs. I think it’s obvious that we have things pretty backwards. Pleasure, rest and relaxation (and don’t confuse that with numbing feelings or “zoning out”) are important habits to cultivate if you seek health, and meal times are a great way to practice. Written by Emily Fonnesbeck for St. George Health and Wellness magazine and St. George News. 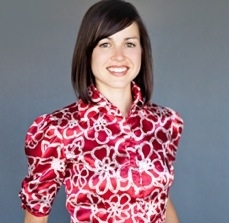 Fonnesbeck is a registered dietitian and received her degree at Brigham Young University. She is a member of the Academy of Nutrition and Dietetics and belongs to the practice groups of Hunger and Environmental Nutrition and Sports, Cardiovascular, and Wellness Nutrition. She has a certificate in adult weight management and uses a non-diet approach and the principles of intuitive eating as she counsels clients.